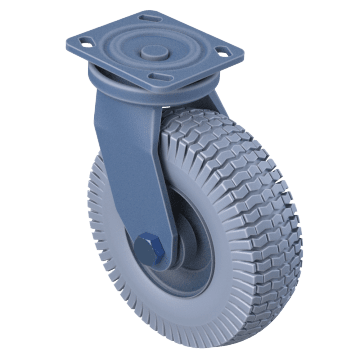 Also known as pneumatic or flat-free tires, these casters are excellent at absorbing shock, making them a good choice for transporting fragile or vibration-sensitive loads. They are ideal for moving loads over uneven surfaces, and are generally quieter than standard-style casters. 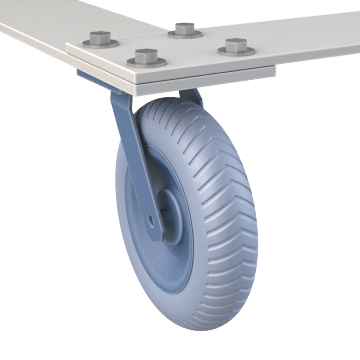 Featuring lightweight, air-filled tires and strong, zinc-plated steel frames, these casters cushion loads against impact and have double ball swivels for smooth maneuvering. Pneumatic casters are more economical than semi-pneumatic and flat free, but are susceptible to punctures and require more maintenance. They are a good choice for areas where sharp debris isn't present. 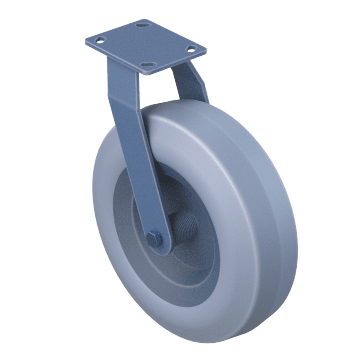 Able to withstand punctures and not go flat, these casters have a thick rubber wall with an air pocket in the center. 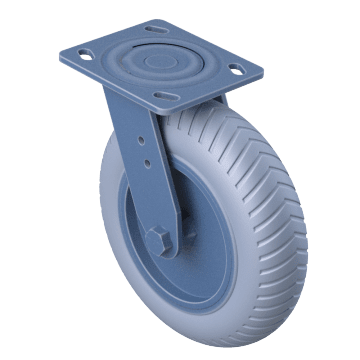 Semi-pneumatic wheels are more rigid than pneumatic and flat-free, making them a good choice for areas with smooth, flat surfaces. Use in areas free from debris that could stop a stiff caster. Intended for demanding construction and industrial environments, flat-free tires can handle areas with sharp debris such as metal shavings, nails, and rocks without affecting performance. Flat-free wheels are made of solid polyurethane foam, which provides the cushion of pneumatic tires without having to worry about punctures. They are nonmarking and more resistant to UV damage than rubber. 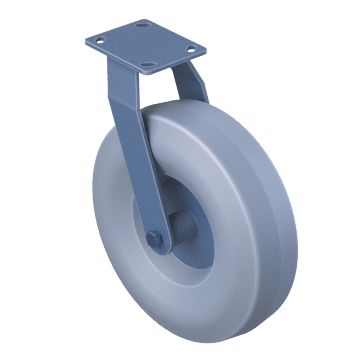 Able to provide cushioning for heavy loads and withstand rougher terrain than standard pneumatic wheels, these casters are often used to transport delicate equipment and in outdoor applications. Built for durability, these casters have thick steel frames and heavy-duty bearings. Support your heaviest loads without worrying about flat tires. 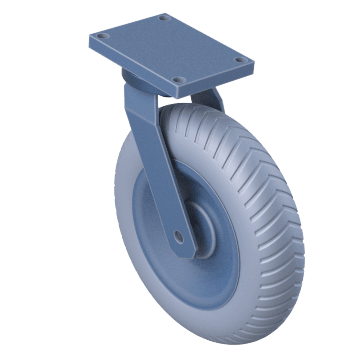 Also referred to as ground support casters, these casters feature a rugged forged steel swivel construction and shock-absorbing, solid foam-filled pneumatic tires, making them ideal for applications like powered towing in industrial and airport settings.